An assortment of meals from Vital Kitchen, a chef-operated prepared meal service in Houston. The lure of prepared foods has endured since the mid-20th century when these became very popular in the U.S. after World War II. Frozen foods were a much-appreciated convenience for women who hadn’t left the workforce and also created a boom in the kitchen appliances industry as our eating culture shifted towards convenience. While the love of convenience endured, better nutrition information means that more Americans are seeking out meals made with “natural,” “whole” and “local” ingredients. Cooking at home can be challenging for some, such as those who work long hours or have children who participate in after-school activities. Some days, the packed big box stores and supermarkets are hard to face. While many are exposed to the big-budget marketing campaigns of national services such as Blue Apron, Hello Chef and Green Apron, there are actually several meal preparation and meals-to-go businesses with locations in Houston. While more expensive than grocery shopping, these meals are huge time-savers that make eating more convenient by providing wholesome alternatives to calorie-heavy take-out and fast food. 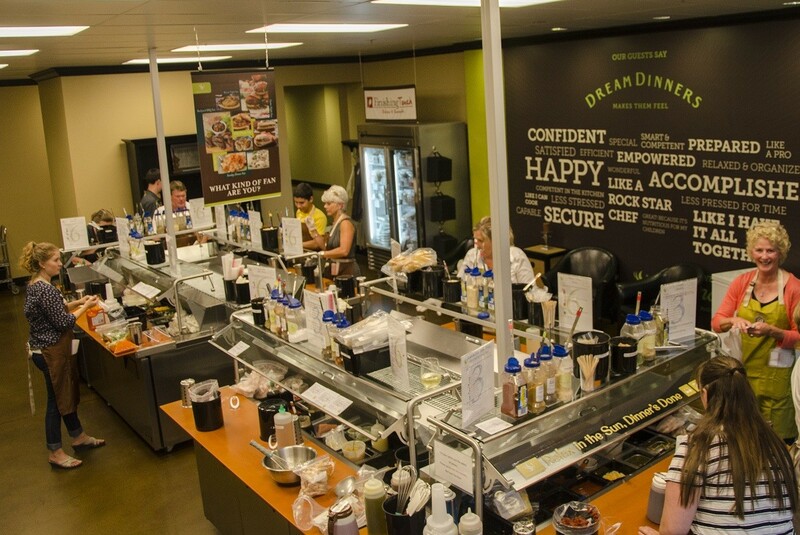 The stations at Dream Dinners where customers assemble their meals in freezer-safe bags for easier cooking. Photo courtesy of Dream Dinners. Dream Dinners, three Houston-area locations: Stephanie Allen and Tina Kuna founded Dream Dinners in 2002 in Snohomish, Washington and the franchise has bloomed to more than 105 locations across the country. Store owners develop monthly menus and post them online. 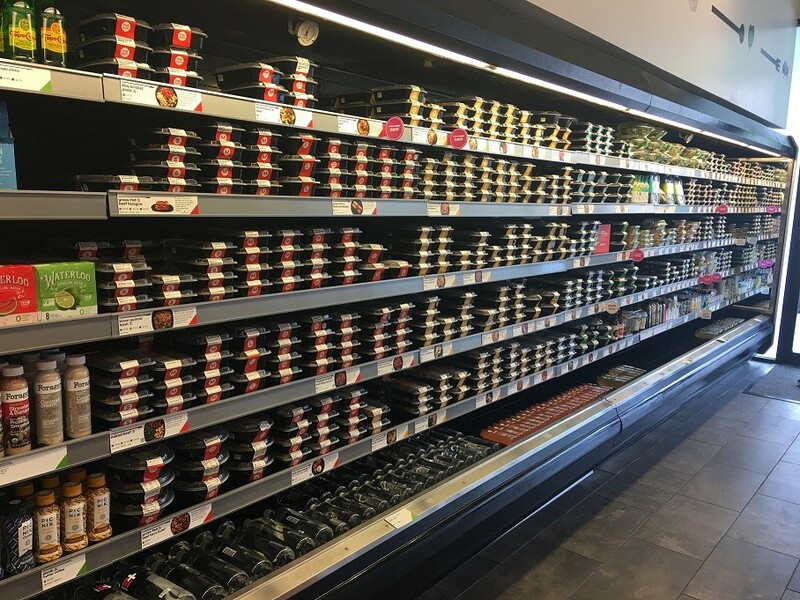 Customers pre-order the meals they want and book a one-hour prep session in the store’s commercial kitchen to gather the ingredients needed for each meal. The store provides recipe cards and heavy-duty freezer bags for each of the three- or six-serving size meals and each meal includes seasonings. There are heart-healthy meal options and most selections cook in under 30 minutes straight from frozen. New customers can take advantage of a special: 18 servings for $84.95. For returning and regular customers, the cost is about $14 to $25 for three-serving meals and $25 to $47 for six-serving meals, depending on which dishes are selected. We tried their guest favorite, Italian Stuffed Shells, and were pleasantly surprised by the ease of the preparation and the reheating process. The large shells are generously stuffed with ricotta and an Italian cheese blend, then topped with marinara, a drizzle of Alfredo sauce and fresh basil pesto. It went from frozen to the dinner table in a little over an hour in the oven. The tender shells and creamy herbed cheese filling paired well with a simple side salad for a delicious lacto-vegetarian meal. 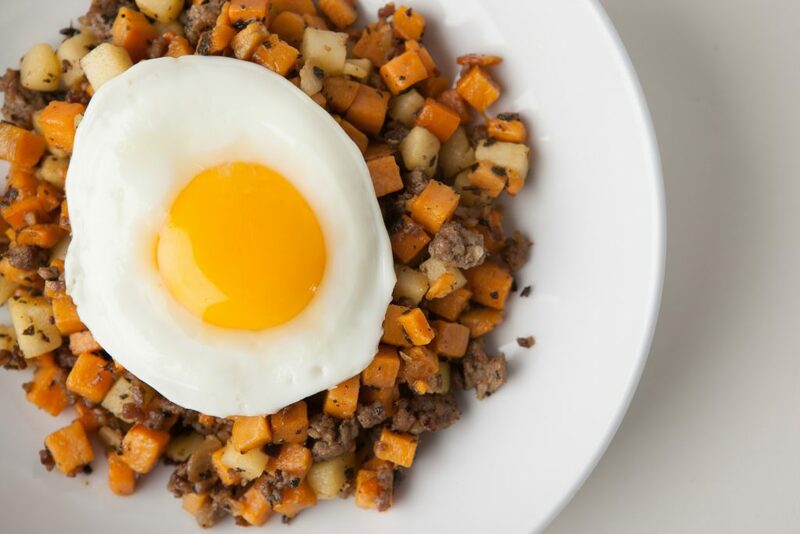 Sweet potato and apple hash with turkey sausage and over easy egg from Elite F’ing Meals. Photo courtesy of Elite F’ing Meals. Elite F’ing Meals, 6906 Airline, Suite 108: Barbara Zuluaga started Elite F’ing Meals in 2013 and initially focused on providing food to CrossFit gyms. Today, Elite creates paleo and ketogenic meals for a much larger audience, including NFL players and busy families. All meals use locally sourced, organic, and chemical-free ingredients and the housemade bone broth meets the same criteria. Zuluaga says the broth takes up to 90 hours to cook on low heat and the store sells 200 quarts a week. Customers can choose from weekly rotation of a la carte meals that cost $13 to $15 or build a 4- or 5-day package for which the cost drops to $12 each. The multi-day packages include breakfasts, lunches and dinners. Popular meals include Keto Pizza using “fathead dough” made with almond flour and mozzarella cheese, Cauliflower Mac and Cheese with Spicy Buffalo Chicken Tenders and an addictive gluten-free brownie made with cassava flour. Deliveries are available within a 60-mile radius around Houston and, for a $13 delivery fee, extends to The Woodlands, Kemah and Conroe. Pick up is available from 11 a.m. to 3 p.m. on Sundays at the commercial kitchen on Airline or any weekday with advance notice. Call the kitchen to schedule a time. Customers can look forward to an Elite F’ing Meals retail location planned in the Heights in 2020 that will feature a bone broth bar. The Meal Simple section at HEB has heat-and-eat meals divided by protein type. Photo by Samantha Morris. H-E-B, over 86 Houston-area locations: The popular H-E-B grocery store chain recently entered the meal kit and prepared meals fray with their Meal Simple section. Most items cost between $3 and $10 and come in convenient, oven-ready trays with nutritional information, and cooking instructions right on the front of the package. H-E-B also has full kits in the $12 to $15 range. 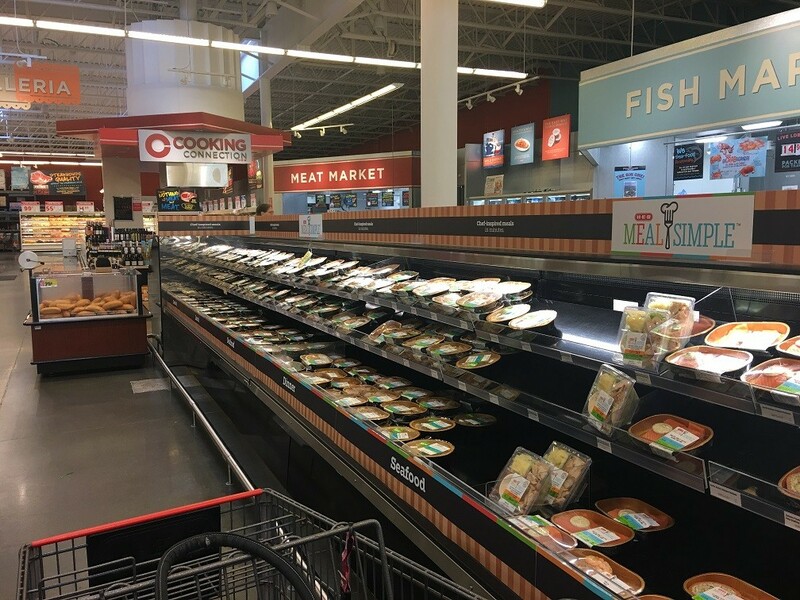 Shoppers can get a wide variety of selections, such as coconut shrimp, bbq salmon with potatoes and asparagus, meatloaf with garlic mashed potatoes and green beans, or Chipotle Chicken with Lime-Cilantro Rice. The prices are quite reasonable, as there are several full-sized meals good for lunch or dinner for only $5. H-E-B also has a new curbside pick-up (with a nominal $5 fee) and a home delivery service (delivery fee of $3.99 for two-hour delivery on purchases of $35 or more). We tried a steak dinner with a boneless petite sirloin, garlic butter, and a parmesan and spinach stuffed baked potato half along with a side of shaved Brussels sprouts with bacon and garlic parmesan butter. Two entrees and the side totaled to $17.78 and each one cooked in 15 minutes. Due to being cooked in the oven, the steak never got a proper Maillard reaction (the thing that makes steak delicious) but the potato half was creamy and had a great fluffy texture. We also tried a shrimp alfredo with penne pasta which was a hit. The use of penne resulted in a pasta that was delightfully al dente and the shrimp were a respectable 16-20 size that didn’t get lost or overcooked. 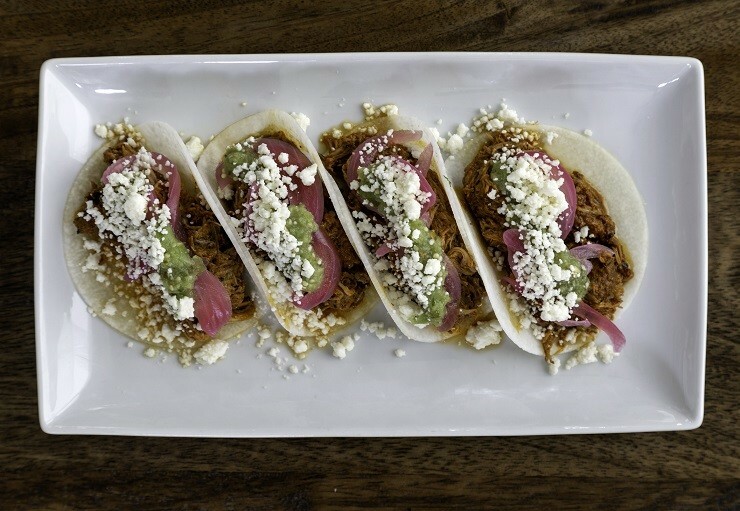 Tacos from Mind Body Fuel with shaved jicama tortillas, shredded pork, pickled onion, tomatillo salsa verde and queso fresco. Photo courtesy of Alvin Schultz. Mind Body Fuel, https://www.mindbodyfuel.com/: Alvin Schultz was a season two finalist on MasterChef in 2011 began cooking full-time in 2016. Six months ago, after almost a year on a ketogenic diet himself, Schultz and partner CJ Kirk started Mind Body Fuel, a keto meal subscription service. Customers can visit the Mind Body Fuel website and submit a sign-up form complete with dietary goals, allergies and preferences. Mind Body Fuel offers plans for 19, 14 or 7 meals per week. The 14- and 19-meal plans are split into two deliveries a week on Tuesdays and Fridays at the Krav Maga Houston Central Campus at 59 and Kirby (2615 Southwest Freeway), so there’s no delivery fee. Meals are low carb or no carb with no added sugar or processed ingredients. Payment is collected weekly and customers can simply email or call Schultz to pause their subscription as needed for travel or other life events. One of their biggest hits is the keto shepherd’s pie with 44 Farms ground beef topped with mashed cauliflower. The cost of the 19-meal plan is $247 a week. The 14-meals-per-week plan can be done as all entrees (lunches and dinners) for $185 or a split between breakfasts and entrees for $175. The seven-meals plan is a single delivery at $97. Broad variety of breakfasts, lunches, dinners, snacks, juices, sides, soups, salads and desserts at Snap Kitchen. Photo by Samantha Morris. Snap Kitchen, 11 Houston area locations: Snap Kitchen was started in 2010 by Martin Berson, a former managing partner at Benjy’s Restaurant in Houston. Snap Kitchen creates a large variety of meals to suit any dietary restriction or preference, including paleo and Whole 30 vegan or low-carb. A la carte breakfasts cost between $4 and $7 while lunches and dinners range from $7 to $15, depending on whether the customer picks a small, medium or large meal. At the time of this writing, new customers could download the convenient Snap Kitchen app and get $10 off the first purchase. Snap Kitchen offers free delivery services to certain areas and customers can also pick up meals from the stores. We tried the Thai Grain Bowl as vegan meals can be difficult to find or aren’t broadly appealing to non-vegans. It was fresh and had a pleasant crunchy texture. It was bit bland, but at 16-percent protein, it was filling and even a non-vegan is likely to be satisfied. We also tried Turkey Bolognese to see if Snap Kitchen makes pasta with proper texture. Like the grain bowl, it dish was a touch under-seasoned but thankfully the pasta wasn’t complete mush. The small-sized meal portion was generous enough to curb carb-cravings but not leave us feeling heavy. An assortment of meals from Vital Kitchen. Vital Kitchen, nine pick-up locations: A group of former professional chefs, Veronica Rademacher, former sous chef at Ibiza and executive chef of Brasserie 19, Jordan Asher formerly of Ritual and Dosi and Gregg Beebe a former chef at Shade, formed Vital Kitchen in 2016. After Rademacher left her previous chef role at Brasserie 19, she became a health and wellness coach and soon started creating meal plans and prep food for her clients. All of Vital Kitchen’s meals are made with local, sustainably grown ingredients. Customers within the delivery area can have meals delivered for a $10 fee or simply pick up their meals at various gyms and juice bars inside the 610 loop. There’s a twice-a-week schedule, which means every meal is fresh. Vital Kitchens meals are plant-based as well as gluten- and dairy-free, and customers can add proteins if they wish. The meals range from $9 to $13 and come in two sizes, a regular and a large. The regular comes with four to five ounces of protein and the large are six to six-and-a-half ounces of protein. The dish selection includes include turkey meatballs over spaghetti squash and pomodoro sauce with sauteed garlic spinach and roasted chicken tacos with grilled peppers, swiss chard on Teff gluten-free tortillas. We also tried a regular-sized Korean beef barbecue bowl and found that it included fresh, perfectly seasoned sautéed vegetables, tender beef sirloin and brown rice. The vegetables were pleasantly crunchy and the house-made chili paste brought tons of spicy flavor. New customers can use the code “livingvital” on their website to try two meals free before signing up. The days of bland TV dinners are almost nothing but a distant memory thanks to these companies. The field of meal preparation services, especially those that focus on seasonal and local ingredients, is still growing. Now, more than ever, fresh food is right at your fingertips.